Tetris 4000 will surprise you with dazzling 3-D effects including oscillating blocks and interactive frames. You'll also enjoy unusual bonuses such as a bomb that blows up several lines of blocks rotating bonuses special figures and many others. Try all of the numerous game options including popular music and stereo sound effects. The multi-player option allows you to compete with the world and get your name on the Internet's High Score List. 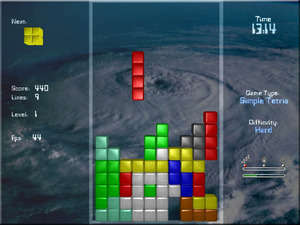 Tetris 4000 1 is a shareware program and can be used as a demo to try the software until the free trial period has ended. A full version of the program is available after the trial period ends. For security reasons, you should also check out the Tetris 4000 download at LO4D.com which includes virus and malware tests. Additional screenshots of this application download may be available, too. 4.47 out of 5 based on 13 ratings. Tetris 4000 has a presence on social networks.